I bought a car with a factory tach installed but not connected. The car has an L20 dizzy electronic distributor. I have located two wires that go to the tach. Where do I connect them to the dizzy ignition system? When I connected one wire from the tach to the Coil neg post and the second wire to ground the tach did show engine speed but it was not accurate. At idle it was showing 2000 rpm. 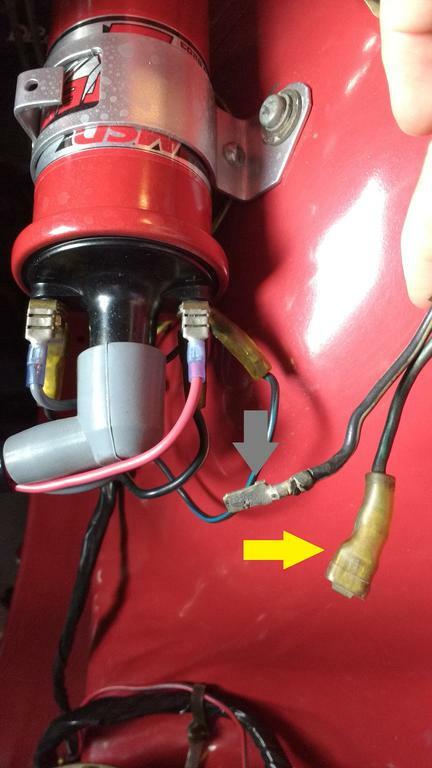 When I connected the tach between the Coil neg and the Dizzy neg as shown in your Dual Wire Tach drawing, the engine would not start. I reversed the two tach wires and that did not help. There are 2 types of factory tach. Some have 4 wires and some have 3. Which do you have? If you had it working, there is a potentiometer on the back to adjust it. Take a look on the back of the tach for a hole and in there is a slot for a screwdriver where you can adjust the reading. Can I tell if this is a 3-wire or 4-wire tach without removing the instrument cluster? It acts like 3-wire but I would like to know for sure. There is also a slot in the back for a small screwdriver.. atleast on the 510 factory tach. Mine was off and acted funny, and then I found out I needed to calibrate it. Used a rpm/dwell meter and I was in business. I am still trying to determine how to identify a 3 wire tach from a 4 wire tach without removing it from the dash. Can one of you smart guys tell me if the face is different? Are you talking about a PL-510? If so, maybe the info I've posted at the link below will answer your questions. Unless you can see the back of the tach by sticking your head up under the dash (doubtful) you need to removed it to see the back and count the wires coming out of it. No real difference in the appearance from the front. Thanks guys, been looking at a dead tach for years, 4 wire tach to an E dizzy, white wires in series with (-) post worked like a charm. Back from the dead! This probably summarizes my situation pretty well except I have the original wiring harness from the tach to the coil that I don't want to butcher or mess with too much. So based on all the information I have received and read, all I should need to do it connect my tach to the wiring under the dash (simple and done) and then (see below pic) disconnect the solid grey wire attached to the negative side of the coil and attach it to the black/white wire (Grey Arrow) and then attach the black/green wire (Yellow Arrow) back onto the negative side of the coil. Does that look and sound correct? Points dizzy or EI dizzy? Not that it makes that much difference but that isn't the stock coil. Thanks Mike for the reply. I decided since I wasn't hooking up anything to a positive that I would try what my picture above showed and what do you know it worked! For future searches my setup was matchbox electronic ignition with a stock tach. There are two 'stock' tachs for the 510. Everything up to '73 was an inductive style with the tach connected in line between coil negative and the distributor. Your '71 (also called the 'White needle') will be this way. The '73 aka (the Orange needle) is simply wired to the coil negative terminal. According to the article (and the tach that I purchased confirms this) there was also an early orange needle tach that is an inductive pickup and a four wire. This requires connection in series with the distributor and coil negative.